The 1.65-inch (42 mm) gun and accessories could be packed on two mules. The gun was introduced as a modern replacement for the aging twelve-pound mountain howitzer. The first gun purchased by the U.S. military from the French arms firm of Hotchkiss was employed against the Nez Percé in 1877. Over the next twenty years the U.S. purchased 56. They were used at the Wounded Knee Massacre in 1890, and again in Cuba at the Battle of Las Guasimas, the Battle of El Caney and the attack on San Juan Hill during the Spanish–American War of 1898. The term "Hotchkiss gun" also refers to the Hotchkiss Revolving Cannon, a rotating barrel weapon invented in 1872 by Benjamin B. Hotchkiss (1826–1885), founder of Hotchkiss & Co. Though superficially resembling a Gatling gun the internals are very different, having only one firing pin rather than a firing mechanism for every barrel. It was a built-up, rifled, rapid-fire gun of oil-tempered steel, having a rectangular breechblock which moved in a mortise cut completely through the jacket. 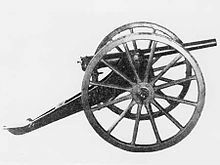 It was designed to be light enough to travel with cavalry, and had an effective range beyond that of rifled small-arms. 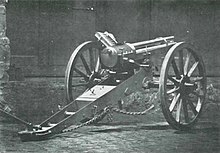 A 3-pounder 47mm Hotchkiss revolver cannon was also adopted by the US and Russian navies in the 1880s. This had five barrels. With 3-pounder and 1-pounder weapons, it is difficult to determine from references what type of weapons a particular ship had. Single-shot, revolver cannon, and (from 1890) Maxim-Nordenfelt 1-pounder cannon weapons were all used on new warships 1880-1910. All of these were called quick-firing or, in the US, rapid-firing. ^ McCollum, Ian. "Hotchkiss Revolving Cannon From San Juan Hill". Forgotten Weapons. Retrieved 11 April 2019. ^ ""Hotchkiss Revolving Cannon- As Mounted for Service Afloat"". modoc1873.com. Retrieved 24 October 2018. ^ DiGiulian, Tony. "Russia / USSR 37 mm (1.5") [1-pdr] - NavWeaps". www.navweaps.com. Retrieved 24 October 2018. ^ DiGiulian, Tony. "USA 1-pdr (0.45 kg) [1.46" (37 mm)] Marks 1 through 15 - NavWeaps". www.navweaps.com. Retrieved 24 October 2018. ^ DiGiulian, Tony. "Russia / USSR 47 mm (1.85") [3-pdr] - NavWeaps". www.navweaps.com. Retrieved 24 October 2018. ^ DiGiulian, Tony. "USA 3-pdr (1.4 kg) [1.85" (47 mm)] Marks 1 through 12 - NavWeaps". www.navweaps.com. Retrieved 24 October 2018.